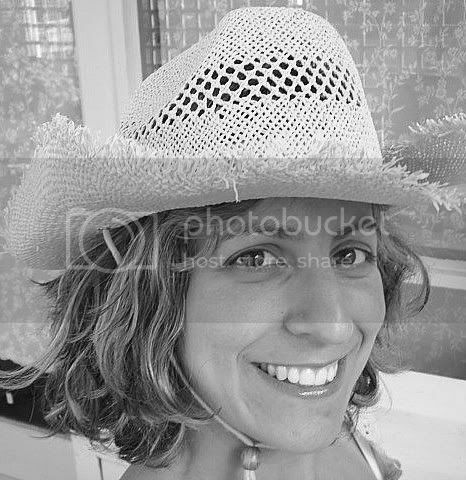 A couple weeks ago, Aleta had a giveaway on her blog. Some of you may know Aleta. She is the proprietress (is that a word?) of the fab new "Flourishes." See her blog for details on her upcoming sales. Anyway, she had a giveaway which I won! Yippee! Most of you know that I have a lot of stuff. I don't usually enter a giveaway unless I really want what is being given away. I would feel guilty if I won something I didn't need or want. But Aleta's giveaway was awesome! Adorable pin wheel, cute paper box, the sweetest fuzzy chick, precious pink roses ribbon and just because she knew I collect vintage tickings she threw those in too. Isn't that so sweet? 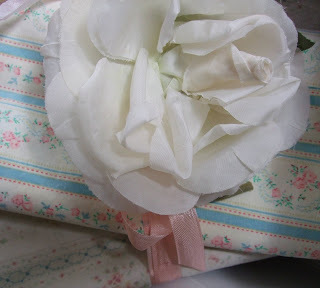 I also just adore the lovely millinery rose pin. 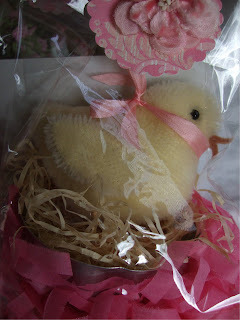 I've already thanked Aleta on her blog, but I want to again say thank you for all the cute things you sent me. I really love it all! Close up of rose and tickings. Love them! I'm so pleased to announce the arrival of my best bud Isabel's new blog! Maison Douce, which means "Sweet Home" in French. You may have heard me mention Isabel on my blog once or twice. She is my partner in "tickled pink" our business venture featuring our booth at Monticello Antique Marketplace and various antique shows throughout the summer. A while back I showed some pictures of Isabel's lovely home and collections. You can see them here, here and here. She is a true collector of all things romantic and vintage. Sometimes it's very hard to shop together as we both love lots of the same things, but we always have a good time and there is always lots of laughter. We love to exchange gifts for birthdays and Christmas because we know exactly what the other will love. Please pay Isabel a visit to say hi. I'm sure she would love to hear from you. Here is another reason why I'm a lucky girl. On my way home from visiting my Mom at the hospital (she had knee replacement surgery) on Tuesday, I don't know what happened, but my car just pulled into the parking lot at the Salvation Army Boutique store. I am suppose to be saving my money for my trip next week, but I just couldn't resist getting these two neat things. 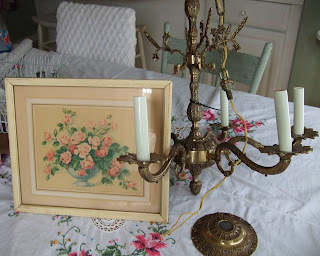 I mean, come on, a vintage pink roses print and vintage brass chandelier? Seriously, how could I pass these up? I didn't notice until my sweet guy pointed it our, but the chandelier has a broken part at the top. But as every true shabby chic girl knows, that that makes no difference. It's still lovely even with the flaw. Unfortunately it didn't come with any crystals and this one needs a lot. I know of a place online, Spectrum Lighting, I think, that sells them pretty inexpensively, but still, it would have been great if it had the originals. Oh well. Today I am meeting my sweet hubby for a lunch date. We haven't done that in awhile and as he is going on a trip to Japan soon, we wanted to do this before he leaves. Other than that, I really need to finish my swap for Heather. Better get on that now. Have a fab Thursday! I love your S.A. goods too. Terrific finds...love the picture. Lucky you to receive Aleta's little goody box! Great givaway!! How generous of Aleta! Awesome thrift finds!!! Lisa you do such a nice job with your blog. I have a hard enough time remembering my password to just leave a comment! Lisa, you ARE one lucky gal! 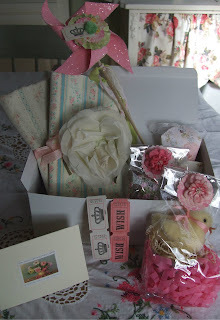 Lovely gifts from Aleta - the ticking is perfect for you! You are also lucky in finding your treasures. LOL that your car pulled over on its on!! Of to check out the sweet house! You have a Salvation Army boutique store???? Neat neat neat finds. If you like antiques, stop by my blog, I'm having a Grand Opening Giveaway! What a wonderful giveaway Lisa! It is all so pretty. 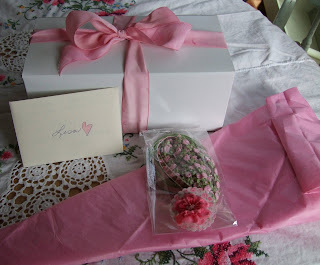 I stopped by Isabel's blog to wish her well... how fun that you get to do this together! Lovely pictures! Have a nice weekend! Oooh lucky you, that giveaway prize is fabulous! Looks like you found some wonderful treasures. Love your blog!